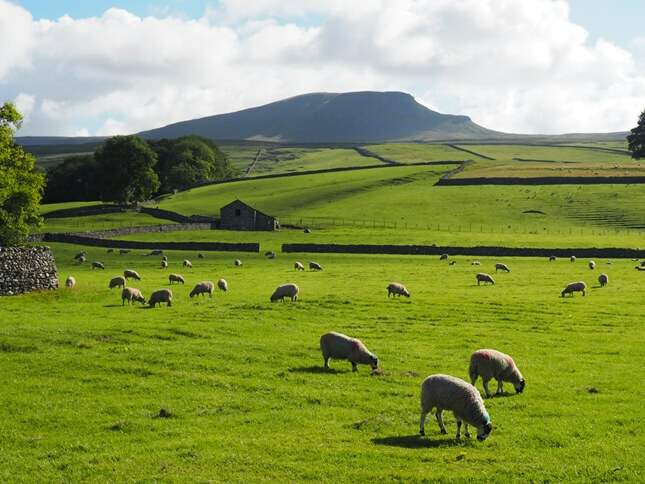 Pen-y-ghent is one of the famous Three Peaks of Yorkshire and, together with Ingleborough, is probably the most recognisable fell in the Dales. 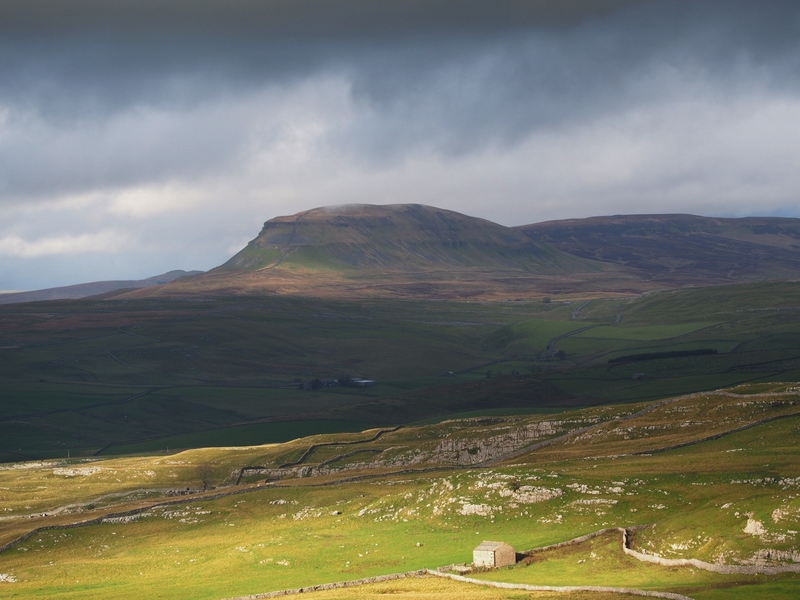 Often spelt ‘Penyghent’, Pen-y-ghent is a rare example of the survival of a pre-Anglo Saxon name for a Pennine summit. No one knows for sure what the name actually means. ‘Pen’ is the Brythonic, and modern Welsh word for ‘top’ or ‘head’. The meaning of ‘ghent’ is more obscure. The traditional translation of ‘Hill of the Winds’, though certainly apt, has fallen out of favour. ‘Hill on the Border’ is the now more accepted alternative. 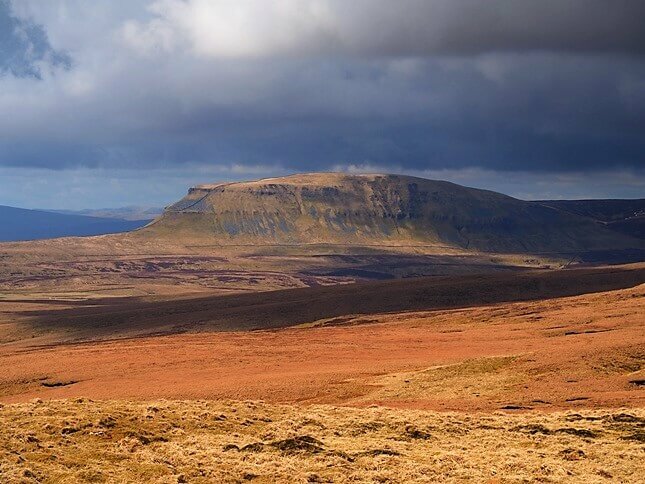 The dramatic profile of the fell is largely due to its geological construction, layers of shales, sandstone and limestone topped with a cap of millstone grit. Perhaps nowhere in the Yorkshire Dales is the transition from limestone to gritstone so obvious as halfway up the steep southern approach on the Pennine Way. 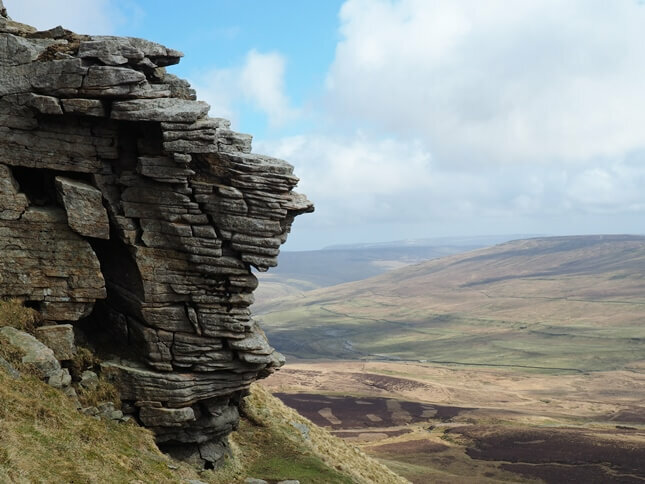 One particular gritstone outcrop worth looking out for is the so-called ‘Old Man of Pen-y-Ghent’, a cloth capped character gurning at the view over Dale Head towards Fountains Fell. 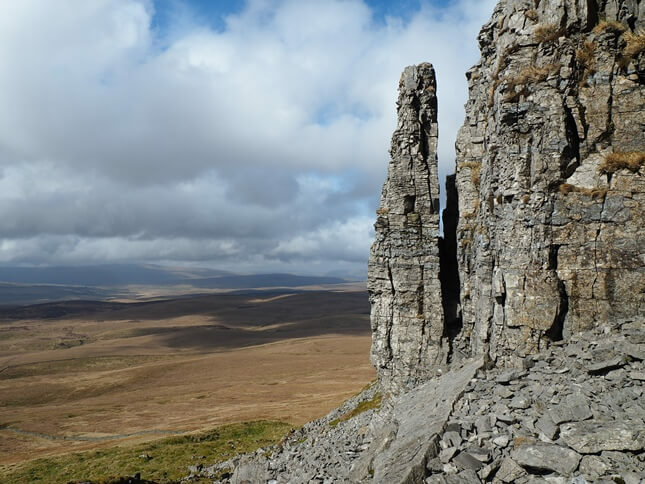 Pen-y-ghent is usually climbed in an anti-clockwise direction from Horton-in-Ribblesdale via Brackenbottom Scar and returning via the Pennine Way. A slightly longer alternative to this is to join Long Lane via Dub Cote and thence to the Pennine Way at Churn Milk Hole. 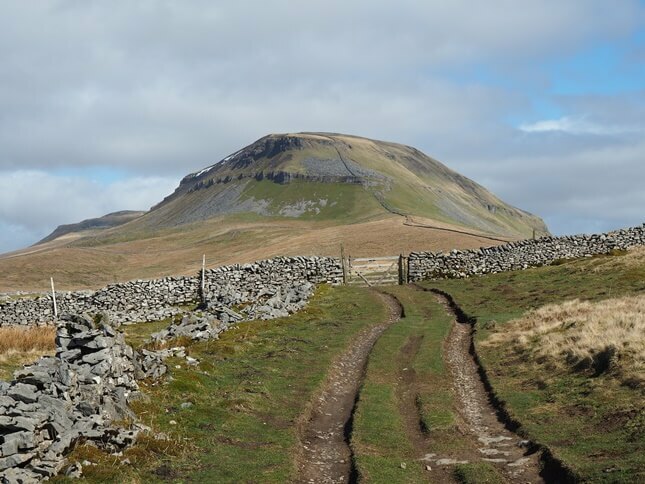 Another option is to continue from Pen-y-ghent over neighbouring Plover Hill and return to Horton via the Foxup road. The shortest route is from Dale Head on the Pennine Way but this approach makes it trickier to devise a satisfying circular walk. For me the relative lack of route options makes Pen-y-Ghent a slightly less interesting entity than either Ingleborough and Whernside. On the other hand interesting features abound in the area. 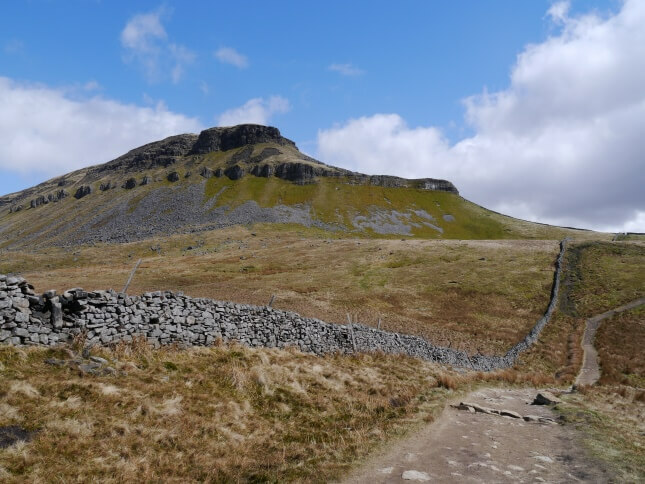 With a few detours to the likes of Penyghent Pinnacle, Hunt Pot and Hull Pot, the walk from Horton turns into an absolute classic. A good day is needed to fully appreciate Pen-y-ghent for it can be a cruel and unforgiving mountain in bad weather. I know because I’ve been up there plenty of times in the rain. On one memorable occasion the wind was being whipped around the nose of the fell so quickly it looked like smoke billowing from a fire. I remember my friend and I tackling the final climb in a kind of running crouch so that we didn’t get blown over. On a good day the view is glorious, especially to the north where the hills seem to go on forever. 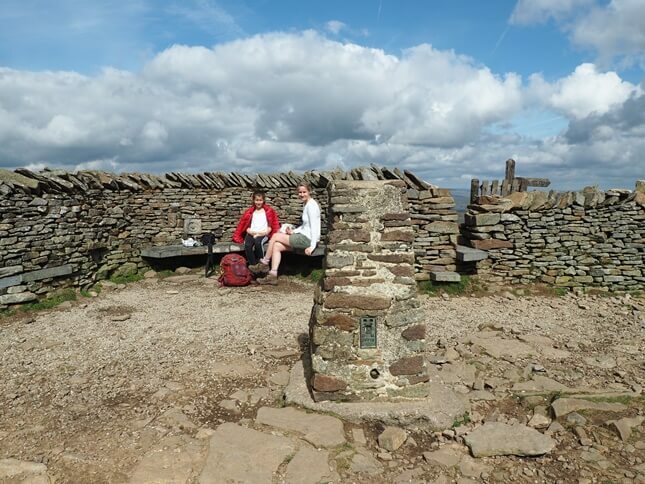 The summit is marked by an Ordnance Survey trig point and a shelter that is cleverly built into the wall. The latter was built in 2004 to mark the 50th anniversary of the Yorkshire Dales National Park.